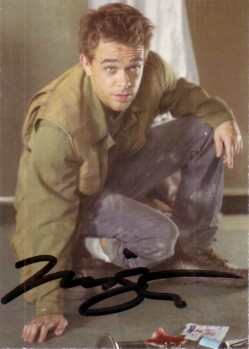 Terminator 3 Rise of the Machines certified autograph card #A5 of star Nick Stahl (John Connor) produced by Comic Images in 2003, autographed on the front in black marker with special congratulations message on the back certifying the authenticity. NrMt-Mt or better condition. LESS THAN 300 OF THESE AUTOGRAPHED CARDS WERE PRODUCED.